Come now, tubw. Are you seriously saying this isn't dumping heat into Canada in the winter? 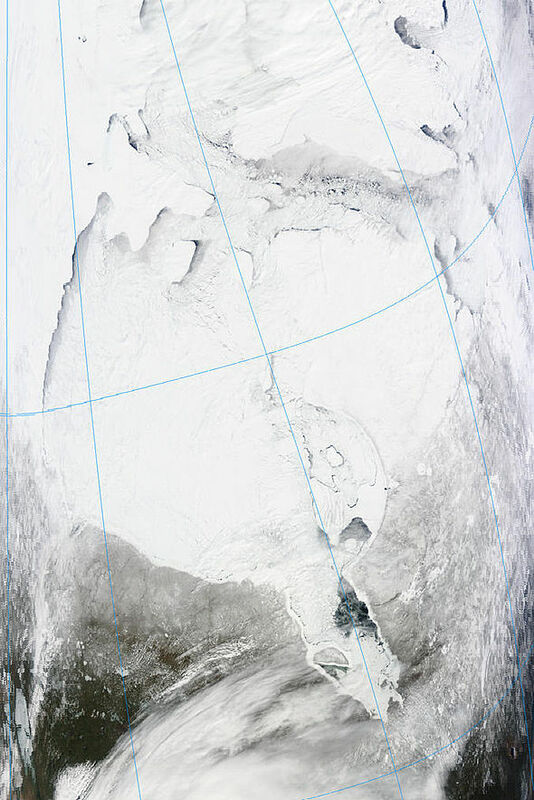 Agree Hudson Bay has its affects but Again it depends what the pattern is doing. Take current for example. How is the Hudson Bay affecting U.S right now? Its not. Winds are not going south/southeast. But yeah, if its frozen over, the winds have no friction over ice so cold air drives over it easier, but its all about how the pattern is. Not as simple as saying it plays a "significant" role. Eastern Canada, yes...Eastern US not so much. It's not that large a body of water anyway compared to lets say the Atlantic/Pacific/ect affecting climates. Look at the upper level pattern to see whats going on, that dictates the flow of everything. Montana warmer than the Northeast?? Bold statement.. What "northeast" location are you referring to? Comparing a state to a region is bold but interesting. Which is why to see the long-term effect I'd look at the average. In the winter, western Montana is somewhat warmer than northern New England. Montana's climate is rather variable, and northern New England isn't exactly consistent either, so it should be easy to winter days when Montana is warmer than the Northeast, even further south. but it peters out going north. And the Rockies get shorter north of about 55°N. Yeah that's basically what I said in my previous posts. North America is more conducive to lower temperatures and snowfall than Asia is, especially Canada. Canada is significantly cooler in summer than Siberia is. Ahh I see. So even though it's arge, it's not so large that it's going to have effects across the entire US as well, unless the wind is blowing in the right direction. So, it's influence is mainly limited to Quebec and Labrador? I should have clarified. Let's compare Montana's warmth to, say, Maine. Maine is at a lower latitude than Montana, but Maine looks like it records much lower temps more frequently. I wonder how much effect Hudson Bay has on those occasions. I'm just like you in winter. I always like to see what influences the Bay has over our winter weather here. Lol, just correcting owen's choice of words. If water did heat up temperatures as owen put it, Quebec and the little section of northeast Ontario on St. James Bay wouldn't have the lowest tree line in the world. That is a beautiful picture Can't believe that is April. All of Europe, except probably Lapland, would be defrosted already. Interestingly, there's less of a southern dip or wave in coldest winter temperatures than in average ones. So, the Rockies have more of an effect on averages than extremes? yeah I see that, but I'm sure you've noticed it, as well? Like, it would be 50 degrees, let's say, in Billings but 20 degrees in Minneapolis and 32 degrees in Boston, etc. ?